Wednesday October 27th 1897 I hurried through the work and Will and I took an early start to town. I stopped at home and he went on up to Dennis and stopped to see how Mary was. Soon after dinner at home we went to town, did a lot of shopping, and came back past the Hedges place where I picked up a few apples. We got home in time to do evening work. Thursday October 28th 1897 I churned this morning, made a new bed and put some feathers I had in it. Soon as I ate dinner I went to the barn and worked till four oclock picking the ducks. Come to the house, did up dinner dishes and got supper. 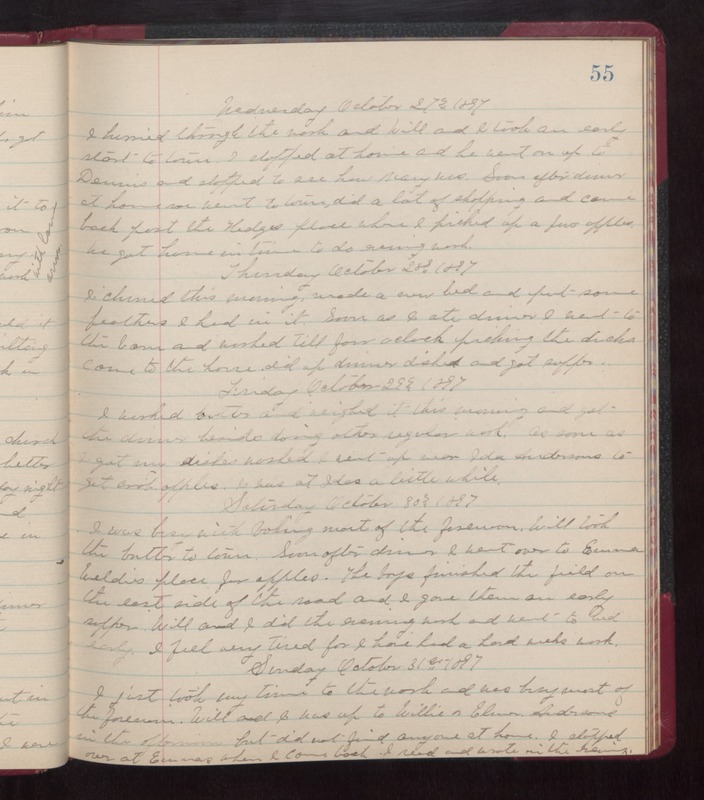 Friday October 29th 1897 I worked butter and weighed it this morning and got the dinner, besides doing other regular work. As soon as I got my dishes washed I went up near Ida Anderson to get crab apples. I was at Idas a little while. Saturday October 30th 1897 I was busy with baking most of the forenoon. Will took the butter to town. Soon after dinner I went over to Emma Weld's place for apples. The boys finished the field on the east side of the road and I gave them an early supper. Will and I did the evening work and went to bed early. I feel very tired for I have had a hard weeks work. Sunday October 31st 1897 I jist took my time to the work and was busy most of the forenoon. Will and I was up to Willie & Elenor Anderson's in the afternoon, but did not find anyone at home. I stopped over at Emmas when I came back. I read and wrote in the evening.